Product #17655 | SKU 8816FM | 0.0 (no ratings yet) Thanks for your rating! 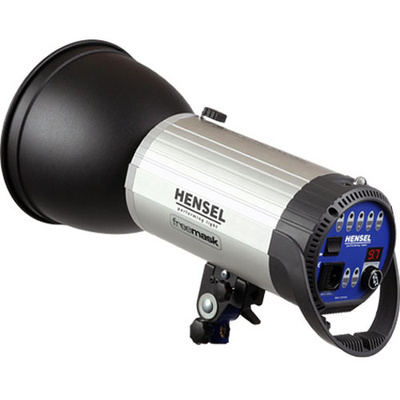 The Hensel Integra 1000 Plus Monolight with FREEMASK provides the power and quality core features on most photographers' wish list, whether they shoot commercial, portrait, wedding, or industrial photography. And the 1,000 W/s Integra Plus is multi-voltage, so you can use it just about anywhere there's electricity; just swap out the 300 W modelling lamp for one of the appropriate voltage. That's just the basics. Besides adaptability and power, the Integra Plus offers the luxury of control. The six f/stop range, selectable in 1/10 stop increments down to 1/32 power, reads out on the bright LED panel; it's perfect for photographers using digital cameras. Besides an optical slave, there's also a built-in, 4-channel Hensel Strobe Wizard radio slave receiver, compatible with the Hensel Radio Slave Trigger, which is available separately. This head includes FREEMASK technology which is used like chroma-keying to composite images. Used with the required, optional FREEMASK transmitter, the head automatically varies the flash output in sequential exposures to create a mask. Recycle Time 0.4 - 2.1 sec.